Are you of the "simple is better" school of cooking? Me too...depending. (mainly pre C-boy), throwing various meaty bits & other goodness into a pot for a slow braise. Other times, not so much. This absurdly satisfying shrimp curry recipe definitely attends the "not so much" school. Seven ingredients. That's it. I've made cocktails that had more ingredients. Oh, and it took about 20 minutes to throw together. You have twenty spare minutes, don't you? Well, if you're like me trying to keep a four month old entertained while you cook, just barely. The rest of you, get cooking, because this dish killed it. It supposedly makes enough for four. However, once w and I started in we couldn't stop ourselves and pretty much ate the whole damn thing. Plan accordingly! is thick enough to coat spoon, stirring occasionally, about 8 minutes. just opaque in center, about 1 minute longer. Spoon rice onto plates. 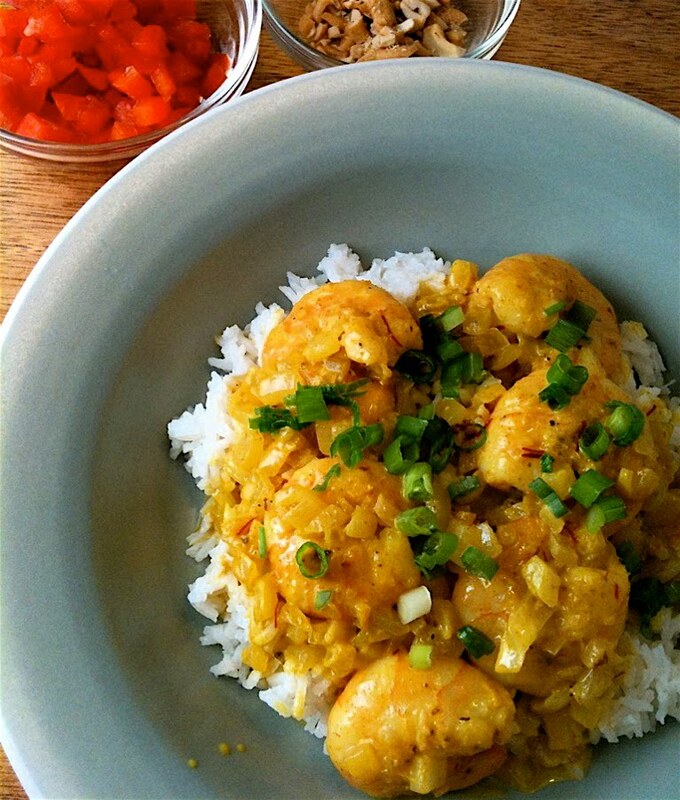 Top with shrimp, sauce and green onions. NOTE: the recipe called for serving this with small bowls of chopped peanuts, toasted coconut, raisins and chopped bell pepper. I used the roasted cashews and red bell pepper I had on hand. I highly recommend the additional options! LLL....something this easy and this good should be made soon. Enjoy!! I love curry. This looks delicious. Kait & Mary.....you are both very perceptive. And soon to be satisfied, I promise! I just made and ate this for lunch! Licking my lips as I type this. It's an awesome delicious recipe, THANKS! melly....Wow! That is instant gratification. SO glad you liked it and what an awesome lunch! Sounds like it might work with chicken...what do you think? Jilliana...chicken thighs would work perfectly. just cook them a bit longer until done. thanks for the comment/question! 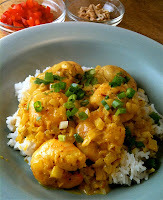 I just started liking curry again and love how simple this dish is - thanks for sharing!! I've made this recipe probably six times already - I had never had it before but its so good - I love how the flavors build! I wonder why some people don't like curry! I love it. Delicious and tasty! will something horribly bad happen if i leave out the clam juice? I've made this a couple of times now and its wonderful - thank you for posting! So easy, quick, and good. Do you by chance have the original link from Bon Appetit? I did a search but couldn't find it. Thanks!